It is simple to cook, and easy to digest, and it can be made savory or sweet. The recipe lends itself to endless creative variations containing grains, beans, vegetables, meats, or fruits. Congee is an everyday food for millions across Asia, either as a breakfast porridge or late-night dinner. It is also reliable nourishment for the sick and frail. Yet this health food remains little-known in the West. 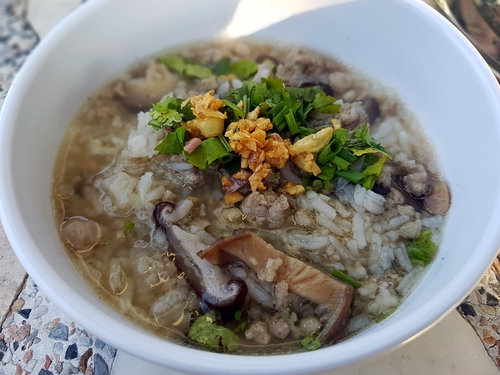 Some form of congee is eaten by people in China, Myanmar, India, Indonesia, Japan, Korea, Laos, Philippines, Singapore, Sri Lanka, Thailand, Vietnam, as well as Turkey, Portugal, Cypress, and Greece. Have you heard of the slow-cooked, watery dish of broken grains known as congee? Maybe you know it by another name? Such a spectacular food must have a long and storied history that establishes it in the pantheon of great recipe traditions. Of course, it does! With the world’s oldest recorded history, China the giant rises up to tell its congee tales. In China, the earliest record of congee dates back to some time between 2697 and 2597 B.C., when the deified Yellow Emperor is said to have cooked grain into congee. Congee’s reputation for healing goes way back to Chinese medicine doctor Chun Yuyi (205–150 B.C.) who treated the disease of the emperor of Qi (314-338) with congee. The highly digestible gruel was officially recorded as medicine by Zhang Zhongjing before 219 in “Treatise on Cold Damage Disorders,” the first book to cover the theories, methods, formulas, and medicines known today as Traditional Chinese Medicine, or TCM. Each year, on January 24, China celebrates the festival of Bodhi Day. It was on this day that Shakyamuni—the father of modern Buddhism—reached enlightenment while sitting under a Bodhi tree. It is said that congee was given to the malnourished Shakyamuni prior to his enlightenment. After sitting there without food and water, the congee gave him the strength to carry on. Bodhi Day was a major commemoration in China by the mid-sixth century, and became a major royal ceremony during the Qing Dynasty (1644-1912) under Emperor Kangxi. Qing emperors conducted the ceremony in one of the main halls at Yonghe Temple in Beijing. The long-reigning Kangxi remodeled this temple in 1694 as a residence for his fourth son, the future Emperor Yongzheng. A highlight of the ceremony was the massive cooking of royal congee. A dedicated antique brass pot weighing 4 tonnes, and measuring 2 meters wide, and 1.5 meters deep, was used for the ceremony. Eight days before it was to start, palace officers delivered firewood and ingredients to the temple. The abundance of ingredients included butter, lamb, grains, nuts, and dried fruits. The ingredients were enough to fill six pots. The first pot was offered to worship the Buddha, the second was for the emperor and palace court, third for the royalty and Grand Lama, forth for court officers in both the palace and in the provinces, fifth for the temple monks, and the sixth was used for alms. According to historical notes, the ingredients for each pot included 60.5 kilograms of foxtail millet, 50 kilograms of mixed grain, 50 kilograms of dried fruits, and 5 tonnes of firewood. The fire that cooked the congee was started a day in advance. It took 24 hours to cook the congee, a process monitored by an officer dedicated by the royal court. Once ready, against a backdrop of bright lights, incense, music, and chanting monks, the first congee would be offered in front of the temple’s Buddha statues. Court members received the next taste. Finally, congee was packed into containers to deliver to other royal palaces and places, by men on the fastest horses. In ordinary households, families ritualized the making of similar congee for Bodhi Day. 1. Congee warms up the digestive system, especially the spleen and stomach. In one school of TCM, the spleen-stomach are regarded as our body’s most important organs. If these are not functioning well, nutrients from our food cannot be absorbed by our body. Chinese medicine doctor Chun Yuyi (205–150 B.C.) taught that congee supplements the energy needed for optimal functioning of our organs. 2. Congee is the best food to eat first thing in the morning, because of its ability to enhance energy circulation. After we rise from bed in the morning, our bodies take time to gradually wake up as well. Eating warm congee offers gentle assistance to help our body’s energy start circulating efficiently. 3. Congee detoxifies by helping the body to sweat. Warm congee helps to warm our bodies, and helps with blood circulation. A good sweat from drinking congee is regarded as a healthy detox ritual, especially for those in the early stages of getting a cold. 4. Congee improves sleep quality. Su Shi, a writer from the Song Dynasty (960-1279), famously wrote in his calligraphy praising how congee helped his sleep. 5. Congee increases the effectiveness of herbal medicine. Zhang Zhongjing, from the Han Dynasty (206 B.C.–220 A.D.), said, a liter of congee after taking herbal medicine can improve the effect. 6. Congee is very low in calories, and perfect for health and weight loss. One cup of congee is about 150 calories, much lower than many other foods, yet it is highly nourishing. One of the amazing things about congee is its versatility. Although rice is most common, it can be made with almost any combination of grains and ingredients. In order to encourage harmony with nature and balance in the body, TCM recommends choosing the ingredients that correspond to the season. Although rice is most common, it can be made with almost any combination of grains and ingredients. Below is a chart that highlights the color, element, organ, and foods relevant for each season. As you see, recommended foods follow the color of the season, so if you don’t see your favorite listed here, feel free to be creative. A couple recipes are also included below. One is savory, and the other sweet. This should get you started on your exploration of congee. Rinse dried black beans and shiitakes. Cover with 4 inches of water. and soak for at least 4 hours. Pour off the soaking water. Place chicken in a colander and pour boiling water over it to wash. Rinse with cold water. In a deep saucepan, add all ingredients except goji berries, salt, and green onions. Bring to a boil. Reduce heat to low, and simmer for 50 minutes, stirring occasionally. Turn off the heat. Add the goji berries and salt. Taste and adjust for salt. Garnish with green onion. Your winter warming congee, that helps develop yang energy for the coming spring, is ready to be enjoyed! Soak raisins in rice wine or rum, if using. In a deep saucepan, add brown rice, black rice, soaked black beans, and 9 cups of cold water. Bring to a boil. Add sugar, raisins, and rice wine or rum, and heat to a boil. Savory Winter Congee can be served for breakfast, dessert, or anytime in between. Enjoy! !